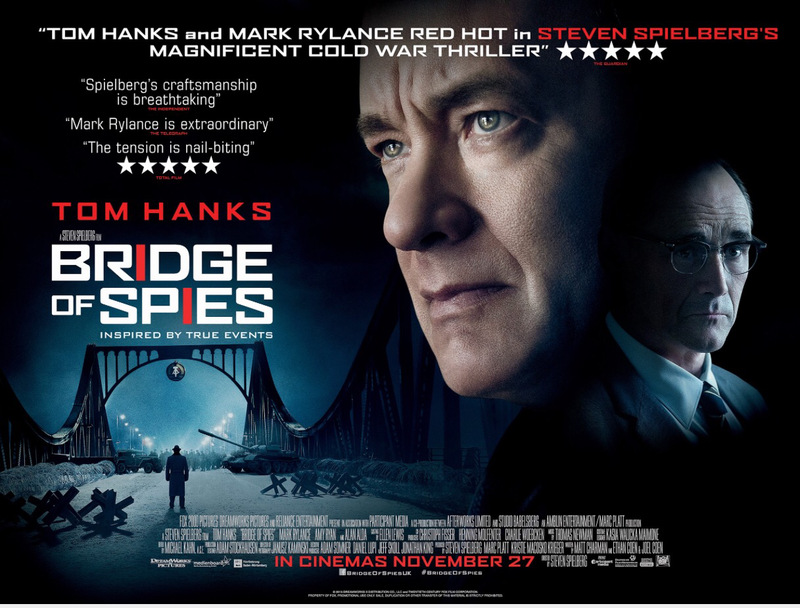 Bridge of Spies had been described as magnificent, nail-biting, breathtaking, gripping and intense. However even its most ardent admirers would have to admit that it is also overly neat, cliched and perhaps even a little trite. The thing is though, these are not flaws; they are just traits of a particular type of film making. Certainly none of what happens on screen is very surprising but this is a classic case of a director being reliable rather than predictable and Steven Spielberg continues to be brilliant just by the sheer will of being Steven Spielberg. He is a genuine auteur whose films are as recognisable as Hitchcock’s or Burton’s and while there are aspects of his work that would be too sentimental in anyone else’s hands he gets away with it with his commitment to the humanity of his material. As much as they have tried, no one makes movies quite like this man and with this Cold War thriller he has given us another brilliant piece of work. Before we get into anything else I want to justify my accusations of triteness because I am sure Spielberg fans will balk at the very suggestion. There are two moments in the film that are revisited and I found them both to be a little contrived. The first concerns the protagonist’s experiences in early 60s Berlin and the harsh treatment he sees of people trying to climb the recently constructed wall. Later on back home he watches some teenagers scaling a garden fence and we feel his relief at being back in the good old USA. It is a little laboured. Similarly there are scenes of him getting shunned by his fellow citizens because he has been appointed as the lawyer to defend a Soviet spy and these are mirrored later by them then admiring him for the way it all worked out. All it seems is good because home and country recognise his heroism. As it is though, the way the film depicts America is one of the many interesting aspects that eclipse any of my momentary reservations. This is no flag waving parable to the American legal system. Tom Hanks is the aforementioned lawyer in this ‘based on real events’ story of the prosecution and prisoner exchange of Russian agent Rudolf Abel and Abel’s trial is depicted as a clear miscarriage of justice that no one wants to challenge. The CIA are portrayed as political animals with no concern for the lives of the enemy or its own citizens and the general public are shown as parochial, prejudiced and naively blinkered. This might well all be accurate; no doubt the post war, McCarthyist US was indeed a nation in the vice of paranoia and nuclear dread, but the country’s values of equality, fairness and progress are only evident in Hanks’ single quiet crusader. It does not show the nation in a good light. Elsewhere the film is tense as you would expect. Like Lincoln, much of the action takes place in rooms and around tables but it is no less compelling for it. The excitement doesn’t come from rolling boulders or giant sharks here but from the inability to trust people in a country where the government will bury you if doing so is even marginally to their benefit, and that goes for both Germany and the States. The story and script, written by history, Matt Charman and the Coen brothers, develops well and never lets you go. In the past Spielberg has had to dress his narratives up with stand out scenes but here, as in Schindler’s List and Munich, he knows not to distract from the plot and that in itself is a masterly stroke. Other directors are so preoccupied with what they can do, they don’t stop to think if they should. At the heart of the film though stands its two central performances. Mark Rylance plays Abel and is getting all the accolades but Hanks is superb too. Of course Hanks has had his share of accolades before and we almost take it for granted that he is an excellent actor but with each film it becomes harder and harder to equate him with the goofy young guy who appeared in Big and Splash. It’s as though Steve Guttenberg became Robert DeNiro. It’s hard enough to think of him as Woody. Seeing these two men play off one another is electrifying and every time they stand together it’s like the cafe scene in Heat. It is hard to put your finger on why but some actors are eminently watchable and manage to impress without resorting to high emotions. The subtleties in both of Hanks’ and Rylance’s performances are just superb and it is a pleasure to watch them work. The considerable combination of Spielberg and the Coens, of course, gives them much to work with. Bridge of Spies feels a little old school but it is undoubtedly a triumph. I’m afraid this isn’t a film where women really feature. Amy Ryan is good as Tom Hanks’ wife but it is a very limited part. It probably isn’t fair to criticise it for this though, as with Hanks’ Captain Phillips, this is a story about men. The movie is about people in positions of power and unfortunately 1957 – 1961 was not a time that commonly gave these positions to women. If you want a female lead film I wholeheartedly recommend Carol, also out this weekend. Bridge of Spies is a 12A. There is a little bit of swearing and some bloodless violence but compared to recent films with the same certificate, films like Spectre and Mockingjay, it is quite mild. Tense but mild.